Honestly, I don't know how this version is different is from the Chennai Molaga Bajji, but I know I have devoured this during my Hyderabad stint and loved it piping hot off the frying pan and wrapped in that newspaper lined leaf pan, it smelt and tasted delicious. Read on how to make this utterly delicious deep fried fritters. Mirchi (less spicy , long and fresh chillies) - any stuff-worthy peppers will do - 12 nos. Sieve the flours, turmeric, salt. Whisk them well, Add 2 TBSP of hot (and cooled) oil. Add requisite water to make a thickish flowing batter. Keep aside. In a bowl, add all the ingredients , mix well and keep aside. Heat oil in a deep bottomed frying pan. Deseed the peppers, and add a tsp or two of the stuffing making sure not to overstuff. Repeat to stuff all the peppers likewise. Now add the baking soda to the covering batter and whisk till slightly frothy. When the oil is smoking hot, reduce to medium. Dip each stuffed bajji and lower gently to the hot oil. Fry on medium-high heat till its golden brown on all sides. Serve hot as is or with coconut chutney / Green Chaat chutney. Omg, these bajjis are seriously amazing, its been a while i had prepared this mirapakaaya bajjis at home, very crispy and tempting they are. OMG Kalyani, those mirchi bajji look just perfect. Like you said, so many memories revolve around these. My dad used to buy these at least once a week - piping hot bajji with chopped onions - I remember eating LOT of them. Good old days. Miss them now. Omg kalyani this is torture , I want some molaga baji now .. You made the bhaji so perfect, am just drooling looking at those.. This is such a nostalgic dish, have so many memories. I am a big fan of molaga bhaji and cut mirchi,wonderful recipe kalyani! !What an wonderful recipe choice again !! Love these bajjis Kalyani! I now regret not buying these chilies from the market last week. I am so tempted to eat a few right now. Not available in teh shops here so got to make it to eat it! !BTW, super choice for the alphabet! These bajjis are my all time fav. We used to get these only in exhibitions, but nowadays these are available everywhere and it is so tough crossing the stalls without buying. You have made it perfect Kalyani. Stuffed Mirch Pakodas are one of the most delicious pakoras. And we have so many versions of this..the Rajasthani being the most popular..next time let me try this version from South, it looks tempting. Bajjis are so good, it's been a while since i had prepared those bajji at home, it's really tempting now. Love the stuffing get into that chili, it must be so delicious!!! Rainy day with some hot Chilli bajji and chai is just an awesome combination ,this is what i get reminded off on see this amazing bajjis!! Guess what, I have never tried the stuffed molaga bajji. I have always tried the light green ones only in ooty and kodaikanal. The stuffing idea sounds interesting. Will try it out. Ah these are my favorite ones Kalyani...so apt for the name...while this may be famous in hyderabad, I have seen bajjis being popular in many places and mostly use the locally available chillies that make the difference..madras chillis use the milder chillis right, that are not used for cooking or making chutneys..anyway I love chili bajjj, thats the end! that is sinful kalyani! i actually wnated to make this for my M in street foods, but then shifted to masala pori as i was skeptical whether kids will like to try it or not!!! Looks totally awesome, i m drooling!!!! It's tea time here , please pass me those sinful bhais. Look just perfect to finish with hot cup of chai and mint chutney. Super tempting. Its amazing how different variations of mirch bajji exists in India. Very popular in Gujarat is the aloo stuffed ones. I've seen mirch bajji being sold on the streets in Bangalore and get tempted to try them. 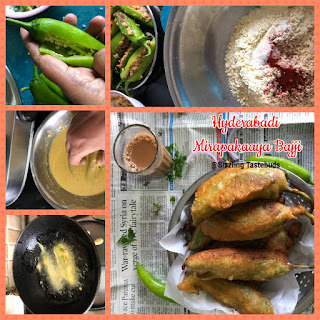 I have always wanted to make the stuffed milagai bajji and trust me for this very reason, I have planted Bajji peppers in the garden this year. Milagai bajji with steaming hot coffee/tea is so tempting! Wow.. i love mirchi vada with tea or coffee.. wonderful snack for monsoon season.